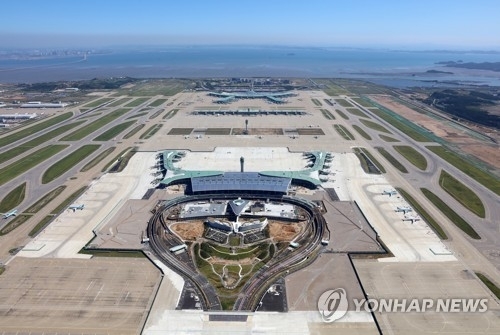 SEOUL, Jan. 9 (Yonhap) -- Incheon International Airport Corp. will begin to operate a second passenger terminal next week, the transport ministry said Tuesday, to meet the growing volume of travelers in South Korea's main gateway. Korean Air Lines Co. and three foreign full-service carriers -- Delta Air Lines, Inc., Air France and KLM Royal Dutch Airlines -- will begin to serve passengers in the second terminal next Thursday, the Ministry of Land, Infrastructure and Transport said. Incheon International Airport Corp. invested 4.93 trillion won (US$4.6 billion) from June 2009 to December 2017 to build the second terminal. In 2015, Korean Air and Asiana Airlines Inc. wanted to move to the second terminal from the existing first terminal. "The government asked them to submit their operating plans for the new terminal. Korean Air was selected over Asiana Airlines after analysis of their plans," a ministry official said by phone. The three foreign airlines were selected because they have business ties with the Korean flagship carrier, the official said, due to the existence of passenger transfer and code-share programs among the four airlines. Asiana and 85 other airlines will use the first terminal, as they have been. The first terminal has been serving 54 million passengers a year. The second terminal can handle an additional 18 million passengers, the statement said. Korean Air will make the first flight from the second terminal at 7:55 a.m. on Jan. 18, to the Philippine capital of Manila, it said.